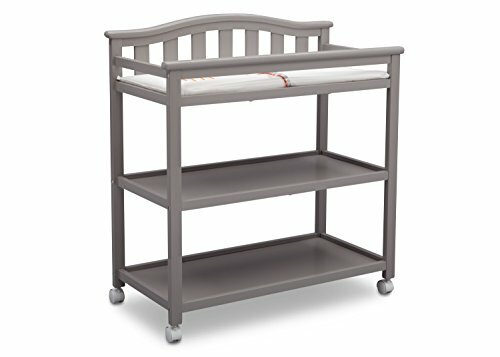 The Bell Top Changing Table with Casters from Delta Children grants you the freedom to easily change and dress your baby. A convenient changing station, this versatile table has a bell-shaped back with slated detailing and a streamlined profile that effortlessly pairs with any item. Outfitted with two fixed shelves to conveniently store your child's essential items, the Bell Top Changing Table also features four casters on the bottom, so you can roll the unit from one end of the room to the other. For your baby's safety, the included changing pad with safety strap keeps your little one secure-even when they won't stay still. Delta Children was founded around the idea of making safe, high-quality nursery furniture affordable for all families. That's why all Delta Children changing tables are JPMA certified, and are rigorously tested to meet or exceed all industry safety standards.